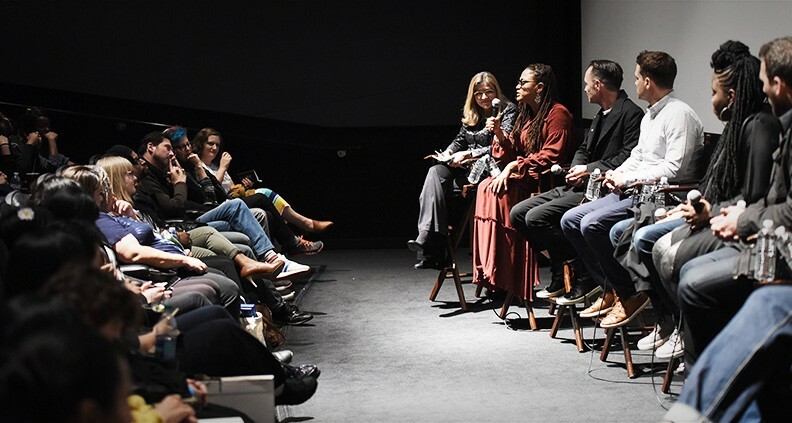 On Wednesday, February 21 at week three of Film Independent’s 2018 Directors Close-Up series, acclaimed filmmaker—and Film Independent Board Member—Ava DuVernay (Selma, 13th) dropped by to discuss her upcoming adaption of Madeline L’Engle’s YA sci-fi classic A Wrinkle in Time. Released by Disney, the film will be in theaters beginning March 9. Joining DuVernay were key members of her creative team: editor Spencer Averick, composer Ramin Djawadi, prop master J.P. Jones, lead hair stylist Kimberly Kimble, VFX supervisor Richard McBride, director of photography Tobias Schliessler, location manager Alison Taylor and casting director Aisha Coley. Award-winning screenwriter Robin Swicord moderated the panel. DuVernay spoke to the process of working with each collaborator, emphasizing the importance of every department on a big-budget project like Wrinkle as well as the challenges of translating a classic work of literature into film. Excitingly, she even previewed four new clips from the film. The director observed that too often the many granular details of a film are easily overlooked, such as props. “The reason why I wanted J.P. here is because he is one of the few prop masters of color in this business, period.” DuVernay continued, “he’s extremely proficient and one of the best at his job.” Every object, every thing the characters touch in a movie is handpicked with intention. No item exists onscreen for no reason. For Jones, researching the tradition of quilting was a crucial step in the beginning stages of the design process. “You take the African American part of the film and you look at quilts and the history of quilts, you go back to the railroad quilts and there [were] hidden figures and maps inside these quilts,” he said, first drawing inspiration from images of quilts he found off Google. DuVernay noted that other departments are often neglected because filmgoers regularly only talk about writing and directing. But that things like location scouting are important. Schliesser spoke to the challenges of navigating location-based logistics. “It could be small things like too many electrical wires around, and I can’t put my lights up because it’s too dangerous,” he said. “I have to literally say, ‘we cannot shoot here.’” The solution? Always approach location scouting thinking: What do I need out of these locations, both in front of and behind the camera? A Wrinkle in Time was the first film DuVernay had worked on without longtime DP Bradford Young, saying: “I remember watching [Schliessler] on set on one of the films that I worked on as a publicist. The film was Dreamgirls, and I love the way Dreamgirls looked. Beyoncé’s skin looks like butter!” she swooned, garnering a laugh from the audience. For Wrinkle’s score, DuVernay knew she wanted Djawadi, the man behind Game of Throne’s iconic “Rains of Castamere” theme music. The composer—who DuVernay called “the king of themes”—said he was immediately inspired by Wrinkle’s visuals, and especially its color. 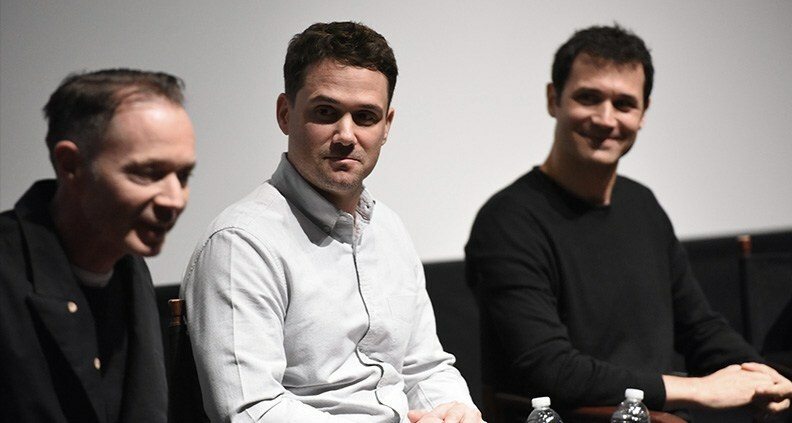 “Ava and I talked about conceptual ideas, thematic ideas, instrumentation,” said Djawadi. “I wanted to make sure that if Ava doesn’t like a trumpet, there’s no trumpets in the score.” And as the DuVernay and Averick’s cut was developing, he’d write to picture. “If I need actors, I call Aisha Coley,” said DuVernay of her longtime friend and “very first” collaborator. 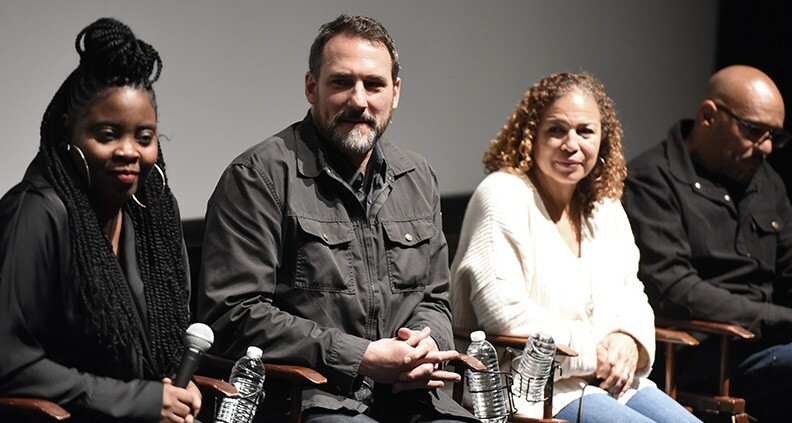 Regarding the character Meg Murry played by Storm Reid Coley was initially skeptical, as she already knew Reid so well from a different project. “I knew she was a well-adjusted person and so grounded. I didn’t know that she could portray the frailties that Meg had,” Coley said. “I sent the tape to Ava and Ava immediately said “This is it, this is the girl.’” Coley credited Storm’s emotional range and predicted great things for the young actor. DuVernay and editor Spencer Averick have a long history. Averick cut DuVernay’s first film, 2010’s I Will Follow for free, as well as DuVernay’s acclaimed 2016 documentary 13th. “[Wrinkle] felt much bigger than anything we’ve done, but I knew right away that this was your movie,” said Averick of his friend and colleague. “It still had this intimate, personal story that we’ve had since the very beginning from I Will Follow, that we did with two actors in a house for $50,000.” Proof that a having a huge scope doesn’t mean the personal gets removed! DuVernay stated that there isn’t another person who loves his or her job more than lead hairstylist Kim Kimble. “Ava said I love to do hair and she gave me plenty of hair to do in this movie!” said Kimble. Regarding seeing the fruits of her labor on set: “Nothing prepares you for when you see them [the actors] step out of the trailer with the clothes, the makeup and the hair. It was awesome.” Kudos to Kimble for pulling off avant-garde hair! “My mind just goes to the story and the experience I wanted the audience to have,” said DuVernay. “This film is for eight-to-12-year-olds. That’s the sweet spot.” Wanting to give an emotional experience to audiences really paid off, with an electric film filled with incredible actors to match the beautiful visuals. A Wrinkle in Time opens in theaters Friday, March 9 fro Disney Studios. For more information, visit the film’s website. 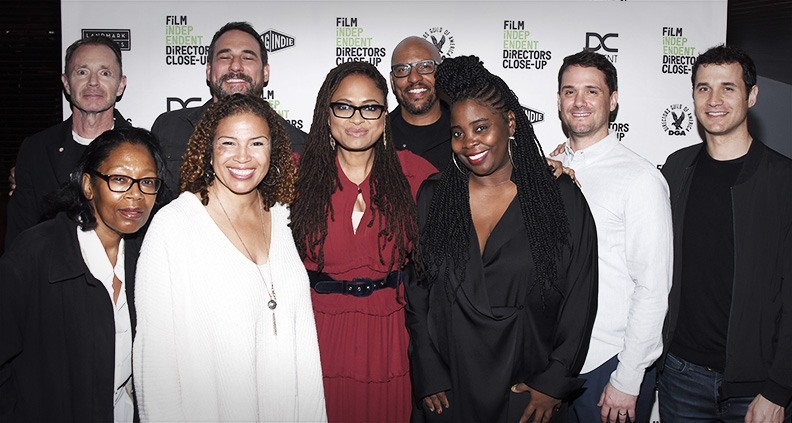 To learn more about Ava DuVernay and her company ARRAY, just click here. The 2018 Directors Close-Up is sponsored by Premier Sponsors Directors Guild of America, Landmark Theatres, TREETI by DECENT, and SAGindie and Principal Sponsors Citi and USA Network. To learn more about Directors Close-Up click here. For more info about Film Independent, please visit our website. To learn how to become a Member of Film Independent, just click here.